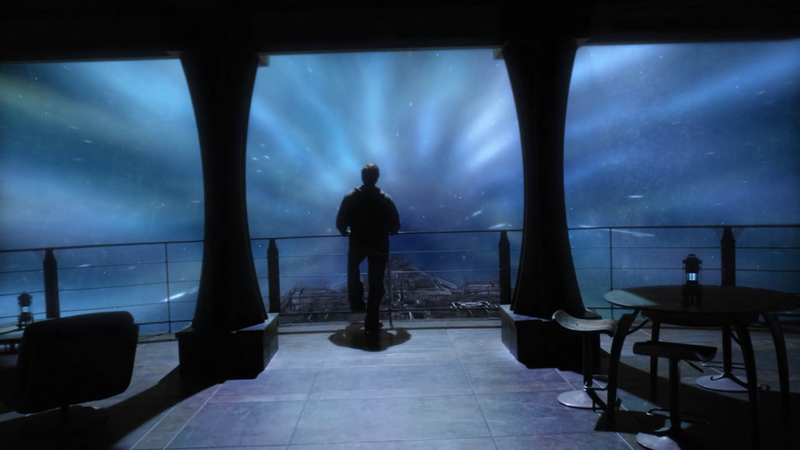 Eli looks out over a railing in a shot very similar to the last of Atlantis–but far more depressing. 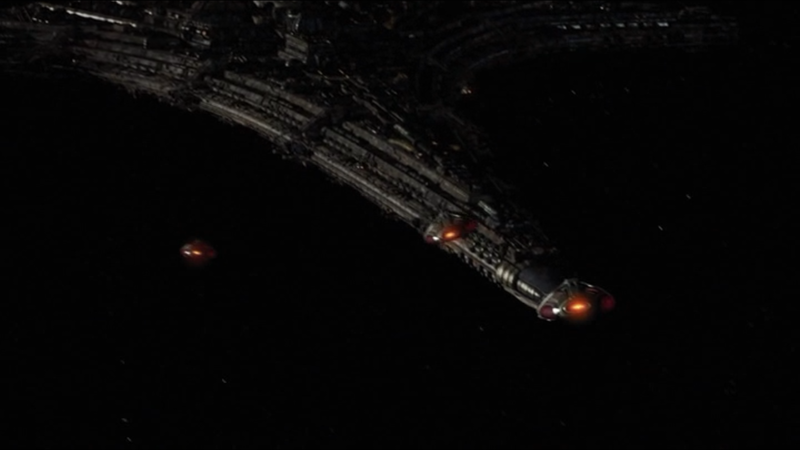 Stargate Universe had a rough start, and it got canceled pretty late in the second season. But the minute it got canceled, every episode suddenly became fascinating. So, fans already knew going into the last stretch of episodes that there probably wouldn’t be any more, and given that the other Stargate series had already ended long before, there was no chance of a “Fully Absorbed Finale,” so to speak. We just had to hope whatever ending we got was decently conclusive. Needless to say, it wasn’t. The show ended with the Drone enemies blocking off every possible way of leaving the ship through the gate, and Destiny badly damaged and low on power. Their only hope is to blast through at FTL until they exit the galaxy, then coast along to the next and hope things are better there. This meant the ship shutting down most areas for a journey that would take at least 3 years, and the entire crew hiding out in these rickety stasis pods until arriving. Except they’re one short, so Eli has to sit it out and hope he can find some way to survive the trip on his own. This is one of those shows that really suffered from the 2008 Writer’s Strike. It started airing right in the middle of it, which meant that the back half of the first season hadn’t been completed yet. So, as a result, the first seasons consisted of a whopping 9 episodes (leaving 4 unfinished). 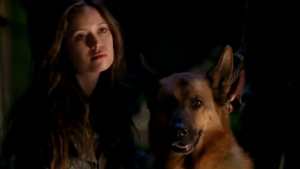 When it was announced that it was renewed, the show took this as a second chance and discarded some old plot threads while bringing in some new ones. It brought up a lot of interesting possibilities, like machines who were trying to find a way to live in peace with humans. The show also featured a mostly female cast, all quite tough characters, which was (and still is) something of an oddity for network TV. The second season was initially scheduled for 13 episodes also, but managed to get a full set of 22, which seemed like a good sign. So they went ahead with the cliffhanger they had planned for the season finale: in an attempt by the AI John Henry to take down fellow AI Skynet, he steals Cameron’s processor and uses a time machine to travel to the future. John Henry’s creator, another reprogrammed Terminator called Weaver, follows him into the future with John Connor, humanity’s last hope against Skynet, at her side. Except when Connor and Weaver arrive, the resistance is fighting all around them, seemingly holding their own against the machines. 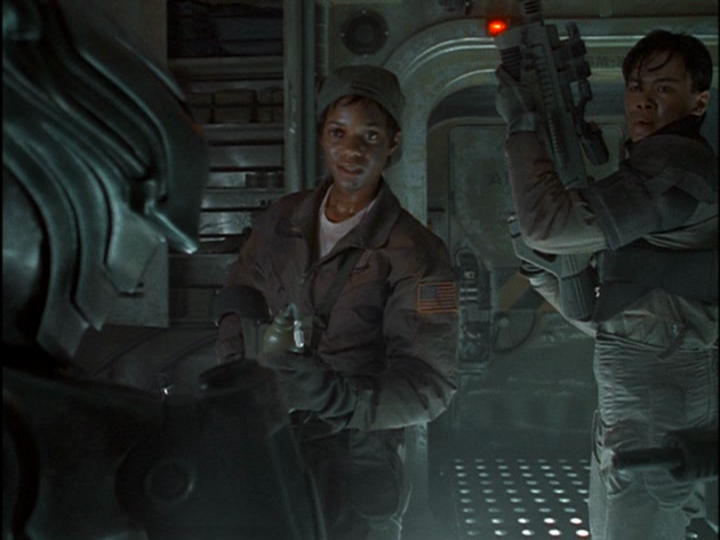 Future versions of Kyle and Derek Reese, along with Allison Young (whose appearance Cameron’s was modeled after), find and capture him, but none of them have a clue who John Connor is. Someone fucked up the timeline, big time. The last scene has our heroes split up in different time periods, Cameron incapacitated (maybe permanently), and the future changed so radically that it seems John Connor never mattered in this world–and more shocking still, the revelation that that might even be a good thing, effectively turning one of the core concepts of the franchise on its head. Where would it have gone from there? We’ll never know; any hope of the show being saved somehow is long gone, and the Terminator franchise is rebooting soon with a new movie and a new TV series in the works. I do have a “What Could Have Been” planned for this series, too. A Chig on the left, about to be drowned due to humans assuming aliens must be just like them. Realism! Space: Above and Beyond is yet another of the myriad sci-fi shows killed by Fox, and also one of the earliest. It was a very military-themed hard sci-fi show (more so than Stargate ever was) that followed a new squad of recruits called “the Wild Cards” as they were sent into battle against the bug-like alien enemies, the Chigs. The show also featured Silicates, humanoid robots that Earth had built as a slave race who eventually rose up, and the In Vitros, commonly called “Tanks”, yet another slave race created by humans (because the first worked out so well). The Wild Cards serve a ridiculously large variety of roles aboard the U.S.S. Saratoga, from special forces to ground troops to piloting fighters, which did have the nice consequence of lending some variety to the episodes. The show was dark and gritty, and probably a bit ahead of its time; I can’t help but feel that had it been created five or six years later, it’d have been a hit. With only one season, the finale ends with humans nearly reaching a peace agreement with the Chigs, who were really just upset about a human corporation infringing on their breeding grounds after being specifically warned not to. But things get unnecessarily heated, and the Chig ambassador kills himself, destroying any hope for peace. Quite a few important Earth officials die in an explosion, which also badly injures the squadron’s Reasonable Authority Figure, Colonel McQueen. The battle takes a turn for the worse, forcing two of the squadron members to take cover in an escape pod that’s slowly drifting into Chig territory, and another pretty much guaranteed dead, although it’s never 100% confirmed. And, of course, now it never will be. But with so many of the characters left at the end of the series in potentially fatal situations, it really becomes depressing as you realize what all of this implies about their fates. Not even a “Bang” like Spike. While not a lot of people have heard of the show these days (although there’s talk of a remake on Syfy), the BBC series Blake’s 7 has had an enormous influence on everything from Babylon 5 to Farscape to Firefly. It set the tone for what a dark and cynical vision of a spacefaring future might be like, even calling their evil intergalactic government the Federation. The characters lack any real heroic traits, pretty much only looking good by comparison; it’s just a very (morally) dark gray setting all around. Imagine a whole show set in Star Trek‘s mirror universe, and it’s kind of like that. Except up to 11. So, the show just follows this ragtag band of rebels striking against the evil empire, right? That’s basically the same plot as Star Wars; how dark could it be? Well, what seemed like it would be the series finale ended with the crew tricked by the Federation into trying to rescue Blake (who’s not there), and their ship, the Liberator, destroyed, leaving them stranded on an alien planet. But that wouldn’t do! So the BBC brought the show back, giving them a new ship and sending them out on their mission again (although this time without the involvement of series creator Terry Nation, of Dalek fame). The last episode, called “Blake,” had the crew once again believing they’d found their missing leader (they did, this time)–except Avon, who’d stepped up to lead in the interrim against his own wishes, believes Blake betrayed him and kills him on the spot. 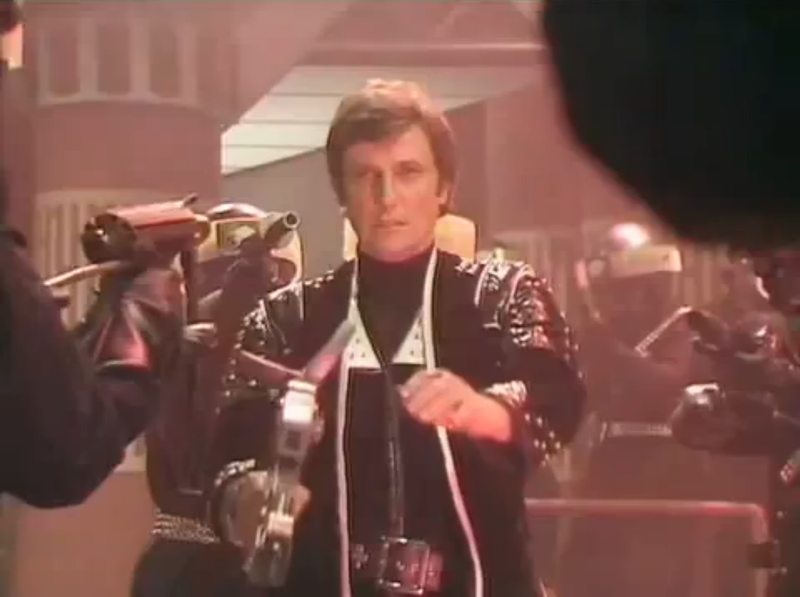 Then the Federation descends upon them, taking out each and every character until finally getting to Avon, the last man standing, who’s surrounded by soldiers with guns pointed at him… and cut to black. But not just black, black with the sound of laser gunfire playing over it. How exactly is this a cliffhanger, then, if everyone seems to be dead? The writers of what turned out to be the final season actually had a plan here to carry on the show. They’d have to kill someone off, but with every character seemingly dead or in mortal peril, the executives thought they could play hardball with the cast, essentially holding the characters hostage. Blake’s 7 was already an incredibly low budget show as it was (more so than Doctor Who, even) so getting rid of another character would be an easy way to help with that. But the BBC didn’t renew it again, and accidentally created one of the darkest endings in TV history.